In 1969, West Bengal chief minister Ajoy Mukherjee became the first serving chief minister in India to sit on a dharna. Ironically, Mukherjee was agitating against deputy chief minister Jyoti Basu, who was also the home minister, over the control of the police forces. 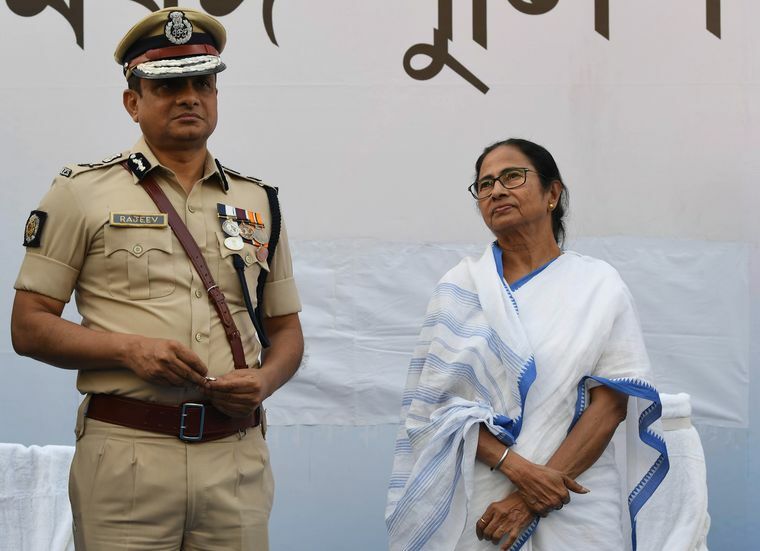 Half a century later, Kolkata witnessed yet another dharna by a chief minister as Mamata Banerjee took the CBI head on, after it tried to interrogate Kolkata Police Commissioner Rajeev Kumar in the Saradha chit fund scam. On February 3, worried that the CBI would raid Kumar’s residence, Mamata ignored protocol and drove to the commissioner’s bungalow. At a news conference outside the bungalow, she announced that she would sit on a dharna till the CBI stopped “harassing” Kumar. With Mamata coming to his rescue, Kumar, who the CBI said was absconding, came out of his house and instructed his officers to control the mob and ensure the chief minister’s safety. As Mamata left for the Metro Channel at the Esplanade, Kumar followed her. A stage was quickly prepared for the chief minister’s dharna, and a makeshift room used by the traffic police was spruced up for cabinet meetings. The crisis began after a CBI team investigating the Saradha scam tried to interrogate Kumar. As the team could not locate him, it went to the Shakespeare Sarani police station to hand over a letter demanding his cooperation. CBI sources told THE WEEK that the policemen at the station attacked their team under Kumar’s orders, which they said was cleared by the chief minister herself. The policemen manhandled the CBI officers, snatched their mobiles and detained them for hours. The Anti-Rowdy Squad of the Kolkata Police soon rushed to the residence of CBI joint director Pankaj Srivastava to arrest him. Srivastava barricaded himself inside his home, refusing to come out. Mamata alleged that the CBI action was orchestrated by the BJP under the direction of the party’s new co-minder for West Bengal, Arvind Menon. BJP leaders believe that the CBI’s pursuit of the Saradha case showed Modi as an effective and fearless leader. After the CBI moved Supreme Court, a bench headed by Chief Justice Ranjan Gogoi asked Kumar to cooperate with the investigation. The court issued notices to West Bengal chief secretary Moloy Dey, director-general of police Virendra and Kumar. The court asked the CBI to question Kumar in Shillong and stayed his arrest till further orders. The Union ministry of home affairs (MHA) has asked the West Bengal government to take disciplinary action against Kumar for taking part in the dharna. Service rules prohibit IPS officers from participating in political activities. Kumar could also be blacklisted by the Election Commission, as he went on leave and skipped the two-day meeting with the commission in Kolkata regarding the upcoming Lok Sabha elections. His participation in the dharna would give the commission reason to believe that he skipped the meeting intentionally. THE WEEK learned that Dey had repeatedly asked Kumar to attend the meeting. Chief Election Commissioner Sunil Aurora has asked the West Bengal home secretary to submit an explanation regarding Kumar’s absence. A former election commission official, who is now posted in another department, said the commission would not let Kumar oversee the election process under any circumstance. “His removal is only a matter of time,” he said. Kumar will also have to deal with the CBI interrogation in Shillong. The way Mamata took on the CBI was a clear message to the Centre on what could happen if the CBI tried to interrogate her. And, it happened at a time when the CBI reportedly got hold of details about how Mamata’s paintings were purchased by the owners of the controversial chit fund. The CBI has made it clear that it is looking at the larger conspiracy angle while filing the final charge sheet. Mamata has been on a collision course with the Centre for quite some time now. On February 2, Prime Minister Narendra Modi was forced to hold a rally in a smaller ground at Thakurnagar in North 24 Parganas, after a big ground nearby was taken over by the Trinamool Congress. A day later, Uttar Pradesh Chief Minister Yogi Adityanath’s chopper was denied permission to land in north Bengal’s Raigunj. The state government had earlier denied landing permission to choppers ferrying Union Home Minister Rajnath Singh and BJP president Amit Shah, much to the annoyance of the PMO and the MHA. 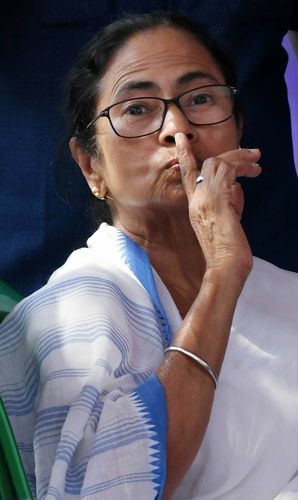 Mamata, meanwhile, alleged that the CBI action was orchestrated by the BJP under the direction of the party’s new co-minder for West Bengal, Arvind Menon. When THE WEEK contacted Menon, he denied all charges. “The CBI is such a big organisation that a small man like me cannot manipulate. Mamataji has a habit of telling lies,” said Menon. Menon, however, refused to confirm or deny it. “I am not the right person to answer this question. It is being looked after by big people,” he said. Menon, who is credited as one of the architects of the strong BJP organisation in Madhya Pradesh, has taken up the task of filling up all 74,000 booths in West Bengal before the Lok Sabha elections. He expressed confidence that the BJP would surpass Shah’s target of winning 20 seats from the state.